Just spent the weekend at Grassy Pond. There's a spot to stop at where the camp host will come out & check you in. You can go to the office later & take care of your bill. Beautiful setting under the trees. It was late October but the mosquitoes were still VICIOUS! Make sure you have repellent with you. Please know that the actual base is about 27 miles away. 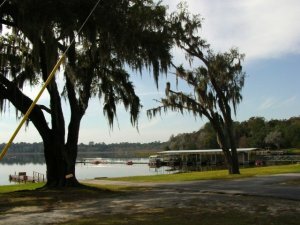 Grassy Pond is a great place to plan to stop if you need an overnight off of I-75. We have an easy time of getting in to the Shell station when we come off the interstate - fill up & drive on to Grassy Pond. This time we decided to stay longer & take advantage of the rec area. There are boats available for rent; great deck behind the office; community fire ring up at the rv area. Nice clubhouse too.